Antique - Art Deco, 25-Piece, Partial Tea Set by Royal Stafford China in Pattern #4895 (per back stamp), Made from the early 1900's. Beautiful Wide Band of Sky Blue, encircles a White Center. 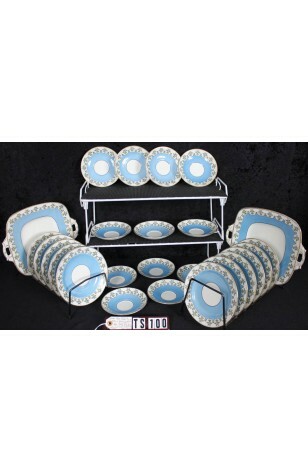 This is an Art Deco Partial Tea Set in pattern #4895 by Royal Stafford China. Scalloped Edge is Outlined in Black, having a Black Verge. A Band in Single Blue Morning Glory Flowers are on the Lip, and the Rim is Decorated by Golden Dots. These are Colorful Pieces that could make a full Tea Set, if White Cups, Sugar Bowl & Creamer were to be Added. 2 - Cookie Platters - 9" x 10 5/8" - Square, Handled, Cookie/Sandwich, 22kt Gold on Handles.